Ice core records and high-resolution marine sedimentary records indicate that glaciations are also associated with "suborbital" climate fluctuations, with dramatic variability on timescales of centuries to millennia. Many of these events likely involve ice sheet dynamics and other cryosphere-climate instabilities, such as regime shifts in sea ice or freshwater forcing of the oceans. The best-documented examples of millennial climate variability are Dansgaard-Oeschger cycles and Heinrich events. Dansgaard-Oeschger (D-O) cycles are ~1500-year climate oscillations that characterize the glacial period, with their strongest expression in Greenland ice cores. In Greenland they are marked by abrupt (decadal-scale) temperature oscillations of as much as 15°C, with concomitant changes in dust transport and snow accumulation rates. Snow accumulation rates in central Greenland more than doubled during the warm phase of D-O cycles. These events are centered in the North Atlantic region, but there are indications of effectively instantaneous, global teleconnections to the North Atlantic climate variability. D-O cycles are associated with and potentially attributable to fluctuations in meridional overturning circulation in the North Atlantic. Reduced deep-water formation during the cold phase of D-O events likely caused reductions in poleward heat transport along with expansion of sea ice in the North Atlantic. Sea ice expansion in turn provided a positive feedback that contributed to the extreme temperature fluctuations and cold, dry conditions in Greenland, through southward displacement of the North Atlantic Drift, the polar front, and the associated baroclinic activity (hence heat and moisture transport). cycles may represent internal variability in the ocean or the sea-ice-ocean system or a modulation of external (e.g., solar) forcing. Marine margins of the ice sheets in North America, Europe, and Iceland responded to D-O climate variability through ice-marginal advance and retreat, with resulting changes in iceberg discharge, but this was likely a response to D-O climate fluctuations rather than a causal mechanism. Heinrich events are a different matter. These intermittent, large-scale fluxes of ice from the Laurentide ice sheet left their mark in the North Atlantic through the deposition of enormous quantities of ice-rafted debris, cooling and freshening of North Atlantic surface waters, southward deflection of the polar front, and disruption of the meridional overturning circulation. Hudson Strait has been identified as the source region for the icebergs. Five or six Heinrich events occurred during the past glaciation, with events lasting from decades to a few centuries. Heinrich events recurred every 5 to 10 kyr once the Laurentide ice sheet was well-established over Hudson Bay and eastern North America, but they were not periodic. These events are attributed to surging or tidewater retreat of an ice stream in Hudson Strait, with the ice sheet disgorging a volume of ice equivalent to an estimated 1 to 3 msl. There was disruption of deep-water formation during these events, due to freshening of the North Atlantic associated with iceberg melting and reduced influxes of subtropical (i.e., Gulf Stream) water. 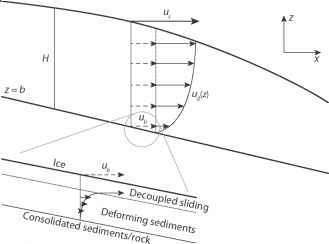 Surging and tidewater retreat are classical, well-documented examples of internal dynamical instabilities in present-day glaciers, although (thankfully) a collapse of the magnitude of Heinrich events has not been observed on the scale of an ice sheet. It is still an open question whether Heinrich events arose purely from internal dynamics or may have been triggered through a climatic perturbation. The former is more likely, because there is no obvious atmospheric trigger, but a more subtle climate forcing such as warmer ocean waters may have destabilized the ice stream. These events are important to understand, as similar behavior in the Greenland or Antarctic ice sheets would pose a large disruption to society.